From my author buddy, Deanna, I just found out about what may be the coolest thing Amazon has done yet! Well, maybe not quite as cool as free Kindles apps for your computer, phone, etc. coupled with all the free ebooks available every day, but still very cool. So what cool thing am I talking about? CreateSpace, Amazon's print publishing solution for all us aspiring DIY authors. Through CreateSpace, you can have your book available in print easily and, are you ready for this? AFFORDABLY! That's right - it's finally affordable to self-publish. So how affordable is it? Well, how about FREE if you do all your own formatting, etc. Does that sound good to you? As near as I can tell, there are no required upfront costs (unless you opt for expanded distribution). And the royalties you earn from each sale (after a reasonable fixed charge per book) range from 40%-80%, depending on distribution channel. Wow! Have things ever changed! If you're not fully appreciating the coolness of this, let me give you a real-life example for comparison. While I don't have the hard numbers at my fingertips, my MIL self-published We Walk the Tall Grass back in 1999. I don't remember her exact upfront costs but I think it was around $200. The book currently retails for $25.95, which is WAY too much for a 200 page paperback. And she only gets royalties after three sales per quarter and then it's a pittance (I'm talking around $6 total). Through CreateSpace, the same size book could retail for under $9 and still generate royalties for her on every single sale, regardless of distribution channel. And if she opted not to have expanded distribution, she could price the book at $6 and still make money on every copy sold. But there are a couple more reasons I am so jazzed about CreateSpace. Firstly, my hubby is currently combining his mom's story about their adventures moving here to the wilderness with an unpublished manuscript written by his dad. We've been researching publishing options and it looks like CreateSpace is it! Secondly, I've got a few book ideas myself - quilt related, of course - and I could publish a full color, 8.5x11.5, 50-page book that retails for less than $10. So, are you seeing the coolness of all this now? PLEASE NOTE: That image of We Walked the Tall Grass is an Amazon affiliate link. If you're just dying to find out all about how these remarkable folks made a life in the wilderness with three small boys and almost no money, go ahead and get the book. But if you can wait, the book my hubby's working on expands the story and will cost considerably less than $25.95. Also, I just signed up as a affiliate for CreateSpace so those two links are affiliate, too. I've just finished a trio of custom memorial quilts. What do you think? Although I used my Loving Arms quilt pattern, each is unique due to the shirts selected to create the diagonal design. 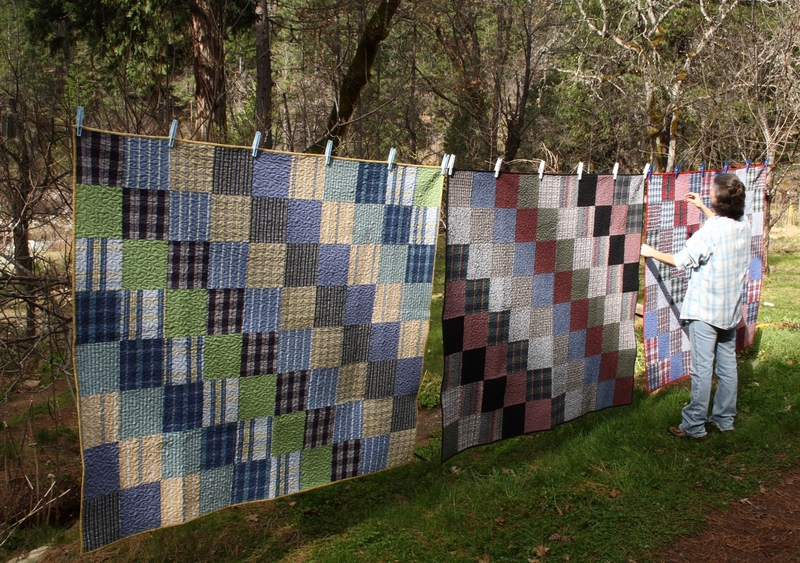 These lap quilts measure a generous 60x75 inches and will provide decades of comfort to each of the daughters (and grandchildren) of a very special man. If you'd like to know more about how you can create quilts from clothing, or if you might like me to create a custom memorial quilt for you, please see my Custom Memorial Quilts website. If you'd like the Loving Arms Wrap Quilt pattern, an instant-download PDF for this quilt design is now available! Just click the link to go to the purchase page on Craftsy.com.